A Subtle Variation from Jason Metcalfe on Vimeo. His Holiness Karma Kuchen Rinpoche was born on August 28, 1970, in the year of Iron Dog, along with many auspicious signs in Southern India, to a noble religious family. When he was 2 years old, His Holiness Pema Norbu Rinpoche (the present 11th Throne Holder) notified his parents that their son is the reincarnation of a great mahasiddha, and his food and clothing have to be clean. When H.H Karma Kuchen Rinpoche was 4 years old, both the late H.H. Dudjom Rinpoche (also the manifestation of Guru Rinpoche) and H.H. Penor Rinpoche confirmed that this child is the unmistaken incarnation of the 4th Karma Kuchen Rinpoche (Karma Thegchog Nyingpo) in their meditations. He was then invited to Namrdoling Monastery where Penor Rinpoche looked after him and provided him with basic education. Karma Kuchen Rinpoche studied and perfected the teachings of Namcho (Sky Teachings) preliminaries (ordinary and extraordinary), Tsalung and up to Dzogpachenpo under the direct guidance of H.H. Penor Rinpoche. He also took the Bhikshu and Bodhisattva vows, and received the Namcho, Ratna Lingpa�s revelations and Rinchen Terzoed empowerments from H.H. Penor Rinpoche. In addition, he received many teachings under the late H.H. Dilgo Khyentse Rinpoche, Dodrupchen Rinpoche, Nyoshul Khenpo Rinpoche, and many other great siddhas. He had displayed infinite wisdom and understanding of Vajrayana and Mahayana teachings when he gave a long discourse at the Ngagyur Nyingma Institute, in the presence of many high Khenpos. Keeping in view of his wonderful qualities of a master, His Holiness Penor Rinpoche appointed him as the Head of the Palyul Mother Monastery in Tibet in 1994. On 14 August 2000, he was formally enthroned as the lineage holder of The Palyul Lineage and is now the 12th throne holder of The Palyul Lineage. Equipped with inconceivable wisdom, modesty, grace and boundless compassion, he has vowed to bring peace and happiness to all sentient beings and spread the supreme Dharma in the 10 directions. Penor Rinpoche on many occasions appreciated his efforts in holding the pure lineage of Palyul tradition and dissemination of Buddha Dharma in the Land of Snows. The significant achievement of Karma Kuchen Rinpoche since his arrival in Tibet was that he had built many temples, stupas, prayer wheels, images of deities and other objects of veneration and faith. Under the direction of Penor Rinpoche, he is now planning to build a very grand and magnificent temple within the monastery premises. 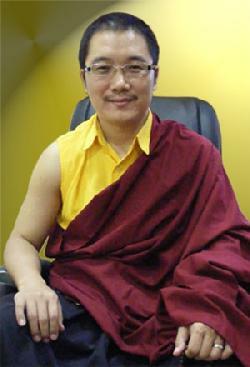 Click here to download a PDF file of His Holiness Karma Kuchen's Long Life Prayer.